Book Vending Machine – the Novel Idea – it’s down the shute! The Website of the Novel Idea Vending Company is blank – there is a reason – in September they went into liquidation. Is this Irish company, now bankrupt, a victim of the Ireland’s hard times, or was this model just not viable in the long run? At the airport you pass through customs, move to the departure gate and wait for your boarding call. After twenty minutes you put down the newspaper, you’ve read it beginning to end. You are relaxed and look at nothing in particular – fellow passengers, the narrow view out the window – then a voice announces a delay to your departure time, you now have time to fill and wish you had replaced the book finished recently. Standing, and a little anxious, you wonder if you should walk back to the bookshop at the other end of the airport. Then you see in the corner of the room, next to the snack vending machine, another; selling books. Immediately you relax again as you approach it. What a Novel Idea! This isn’t, but could be the introduction from a brochure advertising the Novel Idea’s book vending machine. I saw the one pictured at London’s Heathrow in April 2009; I thought at the time that it was a cool thing, although not being a Top Twenty book (or music) consumer I couldn’t imagine myself ever finding a book to buy from the Novel Idea. I saw that while away the first Australasian Novel Idea was installed in Sydney on April 1st. Now, there may have been some in Australia’s Book Trade who thought the launch of this Irish invention to be an April Fools Joke, but the company with local rights (Australia, New Zealand and Asia) had very high hopes for the Novel Idea and proved it was no joke by signing a deal with Booktopia, an expanding online bookseller; to install 200 units nationwide the following August. Booktopia certainly were not the only ones attracted by the Novel Idea, Dymocks Australia (with seven stores in New Zealand1), expressed interest at the launch. And to lend kudos to the concept, back in the United Kingdom at the time it was reported that leading bookseller, Waterstones, was poised to brand the machines around the country. In the US, Dwight Garner (New York Times), after seeing a machine in action while abroad reasoned that if Manhattan could have pay toilets why not stylish book vending machines too? …mag sales are on the decline everywhere, why would anyone want to invest hard earned $$$$ in one of these machines??? …with the terminal decline in print media, these vending machine are about 10 years too late and have missed the boat. The Australian News Agency Blog concerns itself with “…issues affecting Australia’s small businesses, newsagents, media and small business generally,” and they thought the Novel Idea worthy. I must admit I was surprised their reviewer thought a book vending machine “makes sense to me,” one immediately thinks of its impact on the viability of Newsagents, however I had to agree with their reply to some commentators that they would be better to own the concept themselves rather than have it in the hands of competitors. So how does the Novel Idea work and how could it be profitable? While I appreciate Gipter’s enthusiasm for branding opportunities and the possible diversity of items for sale one surely would need to be careful not to confuse or dilute the concept. Advertising as a bonus might be attractive but at the end of the day only book sales will pay the rent. So I came to wonder; what period do you think a return on investment might be? Just consider the cost (or hire) of the unit alone – no account of labour, distribution or variant wholesale costs from differing publishers? – Novel Vending Australasia doesn’t say what costs might be, but here’s a clue to what base costs might start from; in August 2009 the BBC reported the theft of a number of Novel Idea Vending machines (on route to delivery at Stansted Airport), Novel Idea were offering a £2000 reward for each of the £10,000 units! That’s near on $15,000 Australian or $20,000 New Zealand dollars per unit. Now install 200 units. Might have to sell more than eight books a day! This entry was posted in Books, Bookshops & Libraries and tagged Book seller, Book selling, Book Trade Australia, Book Trade Ireland, Book Trade New Zealand, Book Vending Machine, Insolvency Book Trade, Irish Book Seller, Novel Idea. Bookmark the permalink. I don’t understand your comment about having to sell a few more than 8 books if you install 200 machines? It’s 8 books per machine so you would still have to sell the same amount per machine. The wholesale cost per machine would also be less, this would more than compensate for the additional labour costs incurred by taking more machines. There was no thought put into your statement whatsoever. I reported the possible installation of 200 machines for Booktopia. I also reported the machine seller’s statement that eight book sales make a machine viable. I haven’t connected the two at all. I do agree with you however; the costs and profit are relative; one machine or 200. From that $600 subtract: wages, vehicle purchase and running costs, taxes, ground rental for machine, insurances/indemnity, etc, plus the cost of ONE vending machine at $20.000. Quite hefty overheads and capital outlay, and what if a machine doesn’t sell eight books a day? I mean really, you only want to use this machine as a stop gap. No-one will pay $30 + for a book in between flights or on an 18 hour flight. I also thought that it could be a good avenue for self published people to stock their books and make some money. I agree, I think this idea still has legs, the cost of this machine wouldn’t have helped its chances. I have seen magazines and newspaper vending machines that operate successfully. 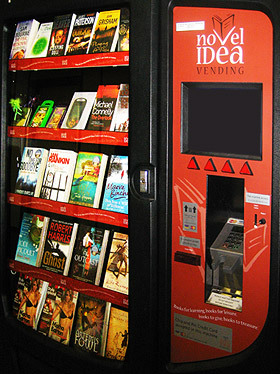 I really like your idea that indie publishers could use a few redundant Novel Idea vending machines! Would love to see one full of fanzines!